Some people just have too much time on their hands. Take Nick Lee, for instance. He was able to load Windows 95 on an Apple Watch and get the classic OS to run on the wearable. The UI is way too small to be useful, but the touchscreen allows the user to open apps. We wouldn't call it responsive, and it takes about an hour for Windows 95 to load. To prevent the slow response times from continuously turning off the screen, Lee added a motor that keeps touching the crown so that the screen doesn't turn off. To load Windows 95 on the Apple Watch, Lee used a WatchKit app that he was able to revise allowing him to install the Bochs x86 emulator. If you want to want to follow in his footsteps, Lee posted whatever code he could on GitHub, and you can check it out by clicking on the sourcelink. 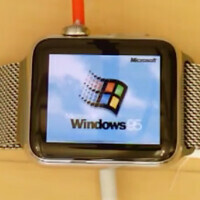 In the meantime, if you want to see what Windows 95 looks like on the Apple Watch, click on the video below. We should warn you that in some respects, this is like watching paint dry. And once again we are reminded of the words said by Jeff Goldblum's character, Dr. Ian Malcolm, in Jurrasic Park. "Your scientists were so preoccupied with whether or not they could, they didn't stop to think if they should." Also Android Wear is still buggy and feels like it's still in beta. Are you jealous for some reason because someone was able to load Windows onto the Apple Watch? Far from jealous. Did you see how slow the Apple watch is? Also the Apple watch is very restrictive for development compared to Android Wear. You can't develop a native app to communicate with other devices directly using wifi or Bluetooth. Android Wear you can. Also you can make an implement your own watch faces on Android Wear, you can't with Apples watch. If anything I feel sorry for the people who paid full price for the buggy slow Apple watch. Even Apple cut $200 off their stainless steel watch for a little while. Clearly you never watched both videos. Android Wear is from buggy especially since it's 2 years old now with second generation and some third gen as well. It's already had 7 software updates. He's jealous because Windows 95 ran better on Android Wear hardware than it did on the Apple Watch. It was actually usable other than it kept running out of RAM on the Android Wear hardware. I am surprise Windows even had a driver that ran the display and the touch Sensor. I wonder how they got a driver for that for such an old OS. Also, why does the fool think we have to be jealous of anything. After all, most times Android does everything FIRST? jealous of what?https://www.youtube.com/watch?v=GZx-LJH5J_I android wear also can run win95. winXP. windows version of counter strike 1.6, half life, and even fallout1..
Is it normal it is THAT slow considering the processors in the 1990s computers relatively to the processor of the apple watch ? Apple must be using a MCU instead of a CPU it's so slow. https://en.m.wikipedia.org/wiki/Microcontroller Don't thank me, thank Google. "Some people just have too much time on their hands." Lol. Watch puns. I CAN FINALLY USE THE APPLE WATCH TO EDIT MY MICROSOFT WORD DOCUMENTS ON THE GO! Big thing, my Nokia 5630XM Symbian got to run Windows 98.